February 4, 2009 by rwb, under Microcontroller. I2C (read as I Squared C) bus first introduced by Philips in 1980, because of its simplicity and flexibility the I2C bus has become one of the most important microcontroller bus system used for interfacing various IC-devices with the microcontroller. The I2C bus use only 2 bidirectional data lines for communicating with the microcontroller and the I2C protocol specification can support up to 128 devices attached to the same bus. Today many I2C IC-devices available on the market such as Serial EEPROM, I/O Expander, Real-Time Clock, Digital to Analog Converter, Analog to Digital Converter, Temperature Sensor and many more. The I2C protocol use master and slave method, the master which is usually the microcontroller while the slave can be any I2C devices such as Serial EEPROM, I/O Expander or even another microcontroller. All of these devices connected to the I2C bus; one for the serial data called SDA (serial data) and the other for synchronize clock called SCL (serial clock); each of these slave devices has their own individual 7 bits of the address length. The 7 bits address consists of 4 bits device identification and 3 bits device physical address. For example if we want to use the Microchip 24AA128 I2C CMOS serial EEPROM, the first 4 bits for this device identification is “1010” and the last 3 bits could be selected by setting the appropriate address at pins A0, A1 and A2 on the serial EEPROM. Therefore by using these 3 bits we could attach up to 8 Microchip 24AA128 serial EEPROM on the same I2C bus; which give you total of 8 x 16 Kbytes of memory. The same principal also applies to the other I2C-bus devices such as the Microchip MCP23008 8-bit I/O Expander and Dalas DS1307 Real Time Clock (see the example picture). 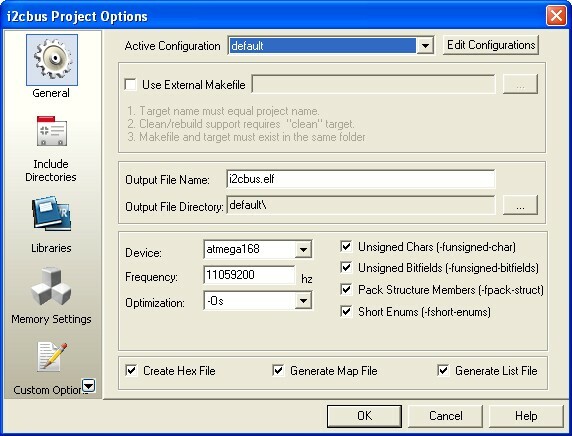 By selecting the appropriate device address, the master can easily communicate with the entire slave devices connected to the I2C bus; the I2C bus protocol only allowed one connection to be established between master and slave at a time. With this powerful and yet simple concept you could see the enormous possibility of using these I2C bus devices for the embedded application. 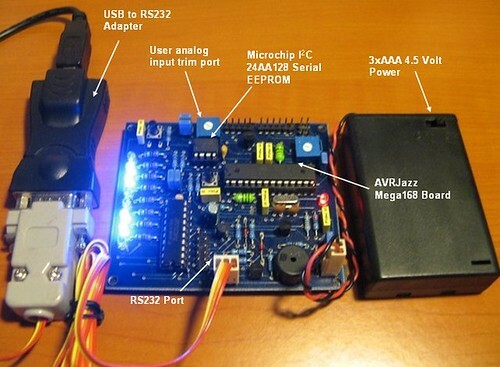 In this tutorial we will use the AVRJazz Mega168 board from ermicro that has build in Microchip 24AA128 I2C serial EEPROM on the board; we will use this EEPROM for storing the LEDs data pattern and later on we will read the data and display it to the LEDs attached to the AVR ATMega168 microcontroller on the PORT D.
The principal we learn on this I2C serial EEPROM device can be applied to other I2C devices as well, the differences is only on the terms used; on the serial EEPROM we use memory address for storing and retrieving the data, while on the other I2C devices such as Microchip MCP23008 8-bit I/O expander or Dalas DS1307 Real Time Clock we use register address for writing and reading the data. 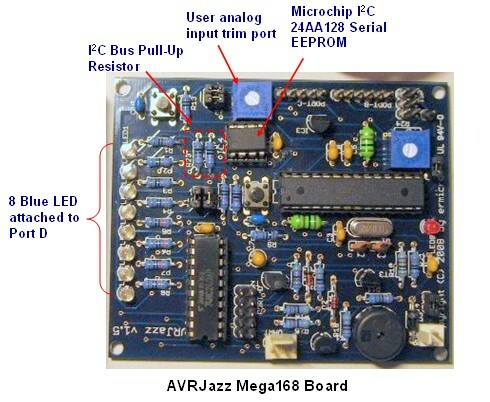 AVRJazz Mega168 board from ermicro which base on the AVR ATmega168 microcontroller (board schema). Atmel AVR Studio 4 for the coding and debugging environment. STK500 programmer from AVR Studio 4, using the AVRJazz Mega168 board STK500 v2.0 bootloader facility. Now let’s jump to the C code that make this happen. The program starts by initializing the ATmega168 ports used and continue with the ADC and the TWI (two wire interfaces) peripherals initiation. The TWI is the Atmel implementation of I2C-bus protocol specification, I don’t know why they named it TWI instead of I2C (perhaps it has something to do with the Philips I2C trademark); Atmel said on the datasheet that the TWI protocol is fully compatible with the I2C-bus protocol; so in other word TWI is the Philips I2C-bus clone from Atmel. 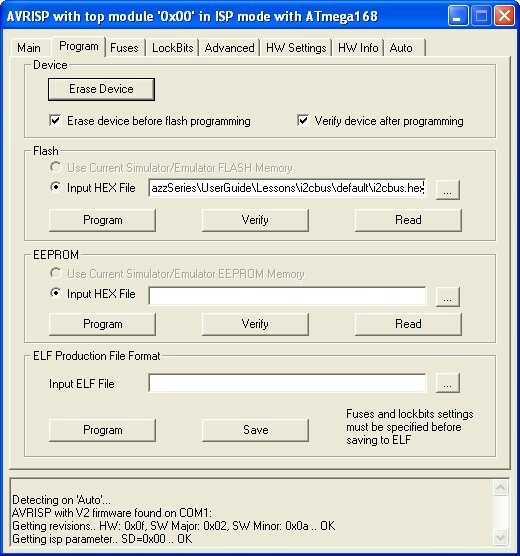 This program basically work by checking the identification marks on the serial EEPROM (0b00001111 and 0b1111000), if not exist than store the LED’s output pattern to it; than inside the infinite loop we just retrieve the serial EEPROM data and put it on the AVR ATMega168 PORT-D. On this project we also use the ADC peripheral to read the user’s analog trim port to control the delay speed of the running LED’s pattern read from the serial EEPROM. The better implementation is to have two mode of operation; the first mode is to read the LED’s pattern from the computer through the COM (RS232) port and store it to the serial EEPROM and the second mode is to read the serial EEPROM and display it. But to keep the I2C bus learning topics as simple as possible, we just use the static data array (buffer) for keeping the initial LED’s pattern. i2c_transmit() function is called by the two function above to transmit the data to the I2C device. As mention before that the I2C-bus used only 2 lines for communicating among the I2C devices; because it use the serial data transfer method therefore the I2C protocol use a clock pulse (SCL) together with the data bits (SDA) for synchronization, each of these data bits is accompanied by the pulse clock on the bus. From the time diagram above we begin the connection by sending the START condition. This START condition is automatically generated by the TWI peripheral inside the AVR microcontroller. By setting TWINT=1 (interrupt flag bit), TWSTA=1 (start condition bit) and TWEN=1 (enable TWI bit), in the TWCR register; the TWI will send the START condition to the I2C bus when it available. Then we just wait until the TWI peripheral confirm that it has sent the START signal to the bus; this can be done by waiting for the TWINT bit in register TWCR to be set (logical “1“) by the TWI peripheral. This TWI setting is a little bit confusing, you see; we activated the TWI peripheral by setting the TWINT=1 (logical “1“) and than we have to wait this interrupt flag to become logical “1“? ; This is what actually happen, as soon as the TWI peripheral active, it will automatically reset this interrupt flag bit to logical “0” and when it’s done the TWI peripheral will set this interrupt flag to logical “1“. Therefore by using the C while statement and masking the TWINT bit in TWCR register, we could wait until the TWINT bit being set by the TWI peripheral. The i2c_transmit() function is use to encapsulate the repetition process of SEND and WAIT, this function will return the TWSR register status with TWPS1 and TWPS0 bits being masked. The TWSR register status macro has been defined in the compat/twi.h include file, therefore using this predefine macro; we could decide whether to continue, retry the process or to quit for error (for the complete explanation of the TWI status register, please refer to the AVR ATMega168 datasheet). The next process is to select which I2C device we want to talk to; this can be done by sending the slave address (4 bits device ID and 3 bits physical address) and the write bit (TW_WRITE = 0, defined in the compat/twi.h include file) and we wait for the slave response. We put the slave address and the write bit to the TWDR register and again using the i2c_transmit() function with I2C_DATA argument to transmit the data and wait for the status returned by this function. When the selected I2C device response with the acknowledge signal; which mean the I2C slave device acknowledge of the address we sent than we could continue to send the data; first we select the memory address and next the data we want to store in the serial EEPROM device. After successful sending the data finally we close the master/slave connection by sending the STOP condition to the I2C-bus. The whole I2C-bus write operation C program is implemented in the i2c_writebyte() function. 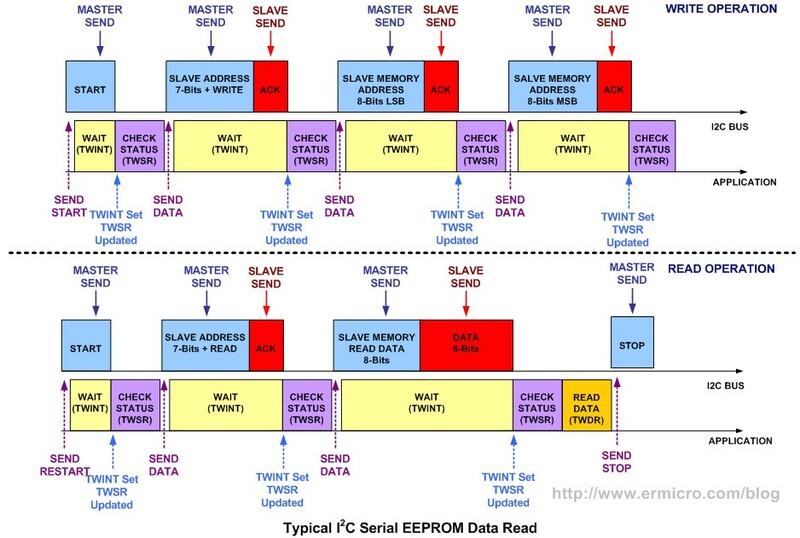 The write process is used to tell the serial EEPROM that we would retrieve the data from selected EEPROM address; this process is similar to the write operation explained above. After we tell the serial EEPROM which address we would like to read than we enter the read operation by again sending the RESTART condition (same with START condition) and assign the 7 bits of I2C slave address with the READ status bit (TW_READ = 1). Notice that because the WRITE and READ operation return different status value in the TWSR register, the compat/twi.h include file use different macro name to define it (TW_MT_SLA_ACK versus TW_MR_SLA_ACK). After receiving the slave acknowledge now we are ready to read the I2C data by sending the SEND data instruction and waiting for data transfer in the TWDR register. The whole I2C-bus read operation C program is implemented in the i2c_readbyte() function. 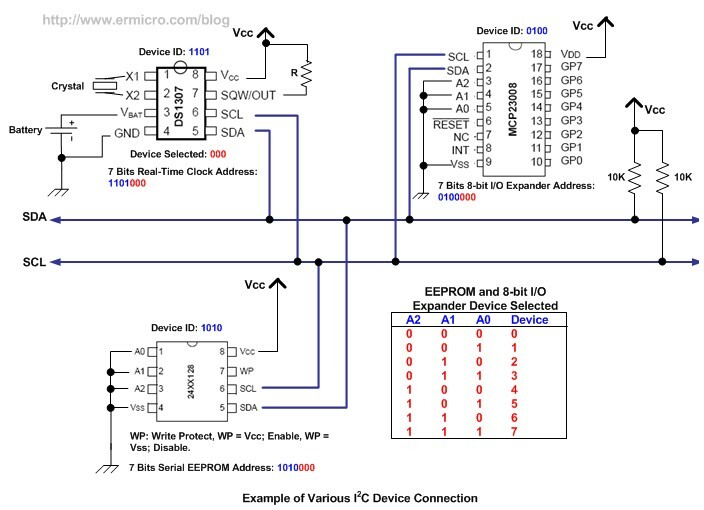 For other I2C devices such as Microchip MCP23008 8-bit I/O Expander, Dalas DS1307 Real Time Clock, etc; the C code presented here could be use as the basic program to write or read from these devices by changing the appropriate I2C device identification, physical address and device register address (memory address). Make sure the Device selected is atmega168 and the Frequency use is 11059200 hz. After compiling and simulating our code we are ready to down load the code using the AVRJazz Mega168 bootloader facility. The bootloader program is activated by pressing the user switch and reset switch at the same time; after releasing both switches, the 8 blue LED indicator will show that the bootloader program is activate and ready to received command from Atmel AVR Studio 4 STK500/AVRISP program. We choose the HEX file and press the Program Button to down load the code into the AVRJazz Mega168 board. These write-ups on using the AVR TWI peripheral are outstanding! I am new to AVR from 8051 and the tutorials were enormously helpful. I have looked at a lot of stuff about using the AVR and your information is by far the clearest presentation I’ve found. I can’t thank you guys enough, keep up the excellent work! Thanks for such a informative writeup. Don’t we have to reset the TWSTA bit in TWCR register after a start condition has been set successfully ? opps the equation is correct my board is an atmega16. Actually both formulas are correct, as the prescaler value is calculated by 4^TWPS, with TWPS = [0,1,2,3] resulting in prescaler values of [0,4,16,64]. […] prescaler values of [1,4,16,64]. thank you for this wonderful tutorial.this is what i called i2c made easy.your style of teaching is great,thank you for sharing your knowledge with confused students like me. in anticipation of your positive response,i wish you a blessed day. First because the I2C slave address (start from MSB) are consists of 4 bits device ID (dev_id), 3 bits physical address (dev_addr), and the write/read bit (0/1). Secondly the TWSR register (start from MSB) are consists of 5 bits I2C status, 1 bit reserved bit, and 2 bits (TWPS1 and TWPS0) I2C prescaler bits, therefore in order to get the correct I2C bus status you need to mask it with 0xF8. Sir thank you for the quick response.i really appreciate your kind gesture. I discovered this when trying to read EEPROM with the Arduino Wire library. thank u for quick reply…. but still i am stuck coz i am quite new to these….. anyways thank you so mcuh…..